We now have the Magykal Number seven Ask Angie. Which is fantastic. I thought it could be a fresh start for anyone whose question or comment I’ve not replied to – and I know there are a few of those. So if you’ve not heard from me please re-post to Ask Angie 7 and let the Magyk begin! I’m back – at last! I’m sorry I’ve been away all winter, I have been hibernating in a writing cocoon, but it has worked. I’m now well on the way with THM book three. The Big Freeze is thawing now and I can face the world again… and give a big apology to all SepHeap blog fans for not answering any questions for ages. I shall get down to reading all your great comments and questions over the next few days. Happy Spring (almost). And if you are way down in the Southern hemisphere, happy Autumn (almost). Laura A, Jennifer E, Geraldine C, Lisa T, and Angela S! You have each won two signed copies of PathFinder. Check your emails as my UK publisher has been in touch!’. So …PATHFINDER is coming out next week! This is a chance for fans in the UK to get some signed copies. TWO signed copies in fact! One for you and one for a friend. All you have to do is email childrensmarketing@bloomsbury.com with PathFinder in the subject header. Winners will be selected two weeks after the competition opens. It’s been a bit crazy here. I just finished SandRider, THM book 2 and Araminta Spook number 7: Skeleton Island and then got attacked by bit of writing burn-out, I think. I have just got to the end of writing THM book 2, which is called: SandRider. I’ve not had space to check in for a while but will be reading all the posts and answering over the next couple of weeks – thanks for all the great comments and questions. If anyone is near Edinburgh this weekend come and see me! I will be at the Book Festival and at 5pm on Sunday I’m going to be talking with Sally Green about writing about the supernatural. I’m really looking forward to this, I think its going to be very interesting. And for any Araminta Spook fans I’m there on Monday too, at 10.30. It’s been a busy month or two here. I’ve been really getting on with writing Book Two of TodHunter Moon, got lost in the middle of the story and almost forgot about anything else! Sometimes that happens and the weeks whiz by without me realising so apologies for not being around recently. I am also at last getting my own website re-done and that’s looking good, though not finished yet. Oh yes, and for all you Araminta fans, I’ve now started another Arminta Spook book called Skeleton Island. If you would like to come and see me talk about Araminta I’ll be at Brighton Festival on Saturday 10th May 2pm and then Luton Hoo on Sunday at 12.15. Come and say hello! It’s been so great to share the USA PathFinder cover – so many people have done such an amazing job on it – not least of course Mark Zug who is totally Magyk. It’s a great time for me with a book as all the hard work writing it is done (bar a few tiny tweaks) and now I get to see Mark’s beautiful inside illustrations coming in. There are twelve new ones and this time they cover a full page. They are so atmospheric and capture the spirit of the story perfectly. As ever! From some comments on Twitter I realise that in the excitement I didn’t make it clear that this cover and Mark’s illustrations are for the USA title only. The set-up is that Harper Collins are my main publisher so I work with them on the Septimus/Tod books. Bloomsbury UK have bought the rights to publish the English, Australian and NZ editions and they have different ideas about marketing the TodHunter Moon series. I haven’t seen what they have decided to do yet, but for all us Brits and Aussies and Kiwis I will keep you updated as much as I can. Okeydokey – back to work on book 2! So excited – we don’t have to keep the beautiful cover for PathFinder secret any longer! I love each and every cover for all the Septimus books, but I have to say that the PathFinder cover is brilliant. So many people have worked on it to get it looking just right and now it makes it debut here, tomorrow. Well it’s snowing on the blogsite now, so it must be Christmas! Hope you all have a great time over the holidays and get a chance to read lots of good things. That’s what I love about time off the best – it’s reading time. We are nearly into 2014 which means it will soon be time for the re-release in the UK of ARAMINTA SPOOK books I and 2: MY HAUNTED HOUSE and THE SWORD IN THE GROTTO. 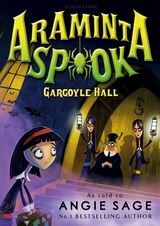 It’s so great to have Minty back out there again and this year a new Araminta Spook/Spookie book will finally appear: GARGOYLE HALL on June 6th. Yes – I got some time to write it at last. The good news is that GARGOYLE HALL will be published in the USA too, by Bloomsbury US, which is great. TODHUNTER MOON book two is coming into existence now, I am about a quarter of the way through and beginning to get a feel for how the story is going. And really enjoying writing about a tortoise… (an Apothercary tortoise, for all who are wondering). Have fun this holiday and here’s wishing you all a very Happy Christmas indeed!